Placentaphagy is the practice of eating your own placenta. 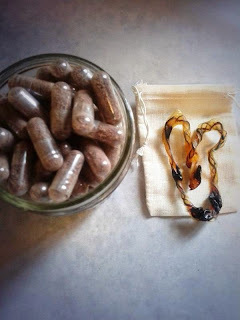 Placenta is great for many things, but is especially wonderful for postpartum Moms. It is rich in nutrients that aid in postpartum healing and well being. Consuming your placenta after birth can help bring your bodies hormones back into balance, stop postpartum hemorrhage, replenish nutrients, increase milk supply and keep postpartum depression at bay. There are many ways to consume your placenta. Some people choose to cook it first, but I wanted to use it raw, so that all the nutrients remained intact. When I became pregnant I started researching the benefits of placenta and decided that I would give it a try. My daughter is now 9 weeks old and I am very pleased that I used my placenta. I lost quite a bit of blood during birth, but I had no issues postpartum. I also had much more energy than I or my midwife expected. I had placenta smoothies for a week after birth and then started on my capsules. You can have someone else prepare the placenta for you or do it yourself. I am DIYer in many other aspect of life, so I figured this should be no different. My midwife offered to help me with it and I gathered all the needed supplies, so that I would have everything ready to go come labor day. For the smoothies I used mixed berries(masks the color and taste of the placenta) and pineapple. usually I would use a scoop of green protein powder, but placenta is rich in iron and protein, so it wasn't needed. For the capsules, I used my dehydrator, spice/coffee grinder, capsules and a capsule machine. Directly after birth, the placenta was double bagged and stored in the fridge. I started preparing the placenta the next day. I took my time with it while baby napped and it turned out to be incredibly therapeutic. While prepping it, I thought of all that we had just been through and how just hours ago, that placenta was inside of me nurishing my baby. I studied the different parts of the placenta and really took in just how amazing it was. In these moments I understood why some women choose to make placenta prints to hang on the wall or plant their placenta. There are several different methods to dehydrating placenta. Here are the basic steps I used. I washed everything that came into contact with my placenta in hot water and then soaked in tea tree oil and grapefruit seed extract. Some of the pictures below are bloody. If you're easily offended don't go any further. Placenta on the deydrator screen. I also dried a piece of my daughters cord for a keepsake. My husband filled the capsules using a capsule machine. He said it made it much quicker.